Making meaning in community can be difficult work. Even in what I call ‘genuine community’ there will be misunderstandings and occasional conflict. Partners in community don’t always get along, but when they find themselves at odds they know how to work together for resolution. In this mini-series of blog posts I am describing the steps or phases of a method for engaging dialogue, building community, and resolving conflict. My Mentallurgy Method of Dialogue is based on a therapeutic approach that empowers individuals to take creative control of their lives. Much about life is beyond our control, but where we put our focus – what we think about, what beliefs we hold, what feelings we have, and what we do with all this internal mentallurgy – is ours to decide. 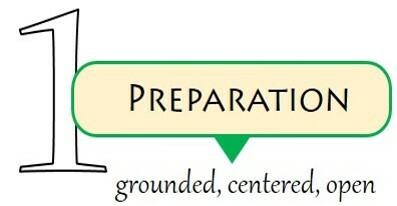 So far, we’ve explored the phases of preparation and consideration. Individuals need to be fully present before they can engage each other as partners in creative dialogue. Once engaged, they need to focus their work on opening a space where each can feel safe, welcome, and included. As I explained, the phase of consideration is ‘considerate’ of the differences that partners bring to the table; but it also helps them transcend their differences in a quest for common ground. Only by staying on the narrow path between urgency (Scylla) and conviction (Charybdis) can we identify the mutual interests and shared values that will lead us to resolution. In this post we will look deeper into the third phase of creative dialogue, DELIBERATION, where partners enjoin a strategy for clarifying their desired outcome. In Mentallurgy we give a color-code to four primary attitudes or energy states of human beings. Green represents desire, gratitude, and hope. Yellow stands for fear, anxiety, and worry. Red means anger, frustration, and resentment. Finally, Blue is our color-code for sadness, disappointment, and grief. An aim of therapy is to help the client (called a “creator”) to more consistently ‘lean into green’ – or in other words, keep their focus on what they really want. Individuals often seek therapy in the first place because their focus has gotten stuck on things that make them feel anxious, frustrated, or disappointed. In short, they’re focusing on what they don’t want and can’t get unstuck. In the DELIBERATION phase of creative dialogue partners clarify their desired result, commonly called the goal (‘G’ in the diagram above). The goal is what they want to reach, accomplish, or achieve. It’s not merely getting to the box and checking it off, however, for the partners anticipate some kind of positive gain upon reaching the goal. This gain is the reward, payoff, benefit, or advantage their success will bring about. Simply put, it’s not the goal itself, which is just a mark for measuring progress, but the gain expected through its achievement that partners really want. That’s why ‘gain’ is color-coded green. From Latin for “to balance or weigh,” DELIBERATION in this context is about weighing a desired result and its anticipated gain against three other factors – all while maintaining focus on the goal. It may be tempting to simply ignore these other factors and fixate only on what we want. But this is the ignórance I mentioned in an earlier post, which is a willful disregard of things that we should be taking into account. So, what are these other factors? In any important endeavor there will always be some factor of risk, referring to the probability of failure – that we won’t reach our goal and get what we want (gain). Partners in dialogue who are working to clarify a truly meaningful goal need to understand that the risk of failure or falling short of their goal is one of the factors that actually elevate its value. If there’s no risk whatsoever, the goal will fail to inspire and motivate, which is a failure of much greater consequence than merely falling short of a target. In DELIBERATION partners conspire to factor manageable risk into their strategy, not out of it. But then again, if there’s too much risk attached to their goal, the high probability of failure will likely distract partners from their creative work. That’s why the risk needs to be ‘manageable’: neither overwhelming nor nonexistent. Any meaningful goal will take time; it may also take money or other resources to make it a reality. In this calculus of success, cost is what we need to give up, sacrifice, or lose in the process. So if gain is the anticipated value added, cost is the value we are willing to give over for its sake. Of course, we run the risk of this trade going badly, of losing more than we gain. Giving time to the collaborative pursuit of a goal at least means that partners are taking time away from other interests and commitments. Just as with risk, however, if what partners really want costs them nothing, their goal will have little attraction or value. It won’t motivate or inspire their best effort. Cost-free ventures are generally not very interesting or fulfilling. Partners should work to minimize the cost but not discount it so much as to render their goal worthless. The third factor that needs to be weighed against the anticipated gain of achieving a goal addresses the effort it takes to get there. There should always be a challenge gradient or degree of difficulty associated with worthwhile projects. Otherwise, if a goal is effortless, it won’t be worth much. In many cases, the degree of satisfaction partners feel upon reaching a goal is proportional to the amount of effort they put into its pursuit. When we lower the challenge gradient – as schools have been doing for students in order to show more impressive success statistics to external funders and state legislatures – we end up diminishing the factor that might otherwise help individuals discover and develop their true potential. 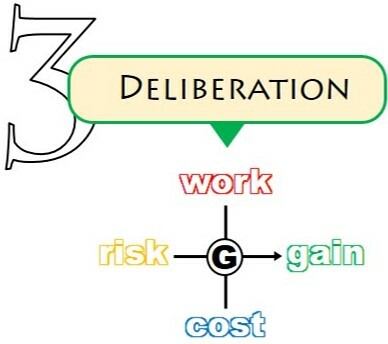 DELIBERATION in creative dialogue is the serious business where partners define their goal, clarify the gain they anticipate with its accomplishment, and carefully weigh this gain against the probability of failure (risk), what they will need to give up for its sake (cost), and how much effort it will require (work). By keeping all these factors in balance, all the while ‘leaning into green’, partners will be able to draw on the strength of their synergy and grow into genuine community. Let’s remind ourselves: Dialogue is different from mere conversation, topic discussion, or competitive debate in the way it involves partners in the co-construction of meaning. Dialogue is about working together; its back-and-forth exchanges are conducted in the interest of respecting differences, building rapport, finding common ground, and cooperating toward a satisfying and meaningful resolution. The first characteristic mentioned above – respecting differences – creates a space where the subsequent tasks of building rapport, finding common ground, and reaching resolution stand a chance. Without it, creative dialogue and genuine community have no hope. In a period of history when difference is a predictable and inescapable part of our cultural landscape, learning how to respect differences has become a new and precious survival skill. Once upon a time, perhaps, a dialogical method of community formation could be the special interest of a relative few – the sages, mediators, and therapists the rest of us went to with our problems. Now we all need the know-how. Those specialized professions aside, an ordinary person today cannot afford to be ignorant about it, and those of us guilty of ignórance (i.e., willful ignorance) will increasingly be the ‘new terrorists’ of the future. In this post we will explore the second step or phase of creative dialogue, assuming that we are familiar with – and actively practicing – step one, Preparation. As I explained in that earlier post, dialogical community is an organic process depending on individuals who are intentionally engaging the practice of being grounded in the here-and-now, centered in themselves, and open to reality. With this necessary ‘work before the work’ underway, the process can advance to the CONSIDERATION phase. The word ‘consider’ literally refers to thinking “with the stars” (con + sidus); contemplating a question, challenge, issue, or opportunity inside a larger (cosmic!) context. In a disciplined way CONSIDERATION reaches out and beyond our immediate reactions or personal opinions in order to navigate – think of sailors navigating their ships by the stars – our best way through a situation. In my Mentallurgy Method of Dialogue, the singular purpose of CONSIDERATION is to find a way through our differences, to a resolution that will be both satisfying and meaningful to everyone involved. Finding a way through should naturally make us wonder: between what? According to this method, we seek a way between ‘urgency’ and ‘conviction’. My diagram above sets urgency and conviction at the extremes of a continuum. Actually, they name what results when this continuum snaps and releases its otherwise creative energy into fixated compulsions. Urgency is the frantic feeling that an opportunity is closing down, resources are slipping away, and we won’t get what we need. On the other side, conviction is when thinking gets trapped inside conclusions that aren’t obviously true but must be true if the meaning of our lives is to hold together. Almost by definition a conviction is beyond question and hence self-excluded from creative dialogue. As you might imagine – heck, just recall a time recently when a challenge to your convictions backed you into a corner where you lashed out in self-defense – when the continuum snaps, urgency and conviction fuse into something no longer creative but potentially destructive. At the very least, it puts an end to dialogue. In Homer’s Odyssey, Odysseus must steer his ship through the Strait of Messina, between Scylla, a six-headed sea monster, on one side, and Charybdis, a crushing whirlpool, on the other. * These metaphors are perfect descriptions of what is meant by urgency and conviction. Urgency makes us panic and scramble for cover, while conviction pulls us into tighter and more constrictive spirals of thinking. Such are what happen when we begin to feel threatened, unappreciated, or left out. CONSIDERATION has the aim and purpose of creating a space where dialogue partners feel safe, welcome, and included. Only then can we acknowledge our differences and explore common ground in a spirit of mutual positive regard and kindness – a second meaning of CONSIDERATION in this context. When we’re not snapping to the extremes of urgency or conviction, the creative tension inherent to the continuum is available for the work of co-constructing meaning. Instead of referring to this continuum obliquely as we’ve done so far, we can now analyze it into its constitutive elements. Ask yourself, “What makes something meaningful?” These elements provide the answer: Something is meaningful to us when it (1) impinges on our basic needs, (2) is an object or subject of interest, (3) carries, reflects, or otherwise represents our values, and (4) is compatible with or validates our beliefs. Touch on all four elements at once and you have a construct that is highly meaningful; touch just one and not others – such as believing something abstract or imaginary with no bearing in real life – and your construct is correspondingly low in meaning. Seeing these elements on a continuum helps partners appreciate where they stand the best chance of finding common ground. Not so much in their individual needs, as these can easily snap the continuum into urgency. And neither in their personal beliefs, as these can easily snap the continuum into conviction. In either case, their engagement will be tapping very close to the less stable extremes on the continuum of meaning. Instead, partners are more likely to find common ground in their mutual interests and shared values, where each is positively invested but typically not so defensive. Interests and values are less binary (on/off, right/wrong) than needs and beliefs, which makes them easier to negotiate and even modify. The CONSIDERATION phase of creative dialogue is where partners ask questions and reflect back to each other what they hear. Reflections are opportunities for partners to confirm, clarify, or correct what they are hearing from each other so that a more accurate understanding can be reached. An invitation to translate their individual needs into interests and their personal beliefs into values opens the path of creative dialogue by helping partners focus on what they have in common. Mutual interests and shared values: this is the way through. * In Homer’s story Odysseus chooses to pass too close to Scylla and lose only a few of his sailors, rather than get pulled into Charybdis and lose his entire ship. My Method of creative dialogue seeks the mid-line where both dangers can be avoided. A method is not like a machine, where once you get it going you can step back and leave it alone. This is particularly true when we’re talking about a method of dialogue and community formation. To step back from dialogue is to abort the process and abandon community. Furthermore, dialogue and community simply do not happen where individuals are not invested in the work. That’s why PREPARATION is the first step or phase in the Mentallurgy Method of Dialogue that we’re exploring in this five-part series of blog posts (Introduction + each of the four steps). If individuals and would-be partners in dialogue mistakenly think that they are stepping into some kind of automatic machine for making community and cranking out creative resolutions, the process doesn’t stand a chance. The higher consciousness represented in the spiritual phenomenon of community does not (and cannot) exist separate from the individuals whose creative intentions combine and fuse in its consilient effect. Neither is PREPARATION for dialogue a simple routine that we do as a way of getting ready for the really important stuff. As an organic process, community awakens and unfolds out of the deeper presence that partners bring to the encounter. And although I am analyzing my method of dialogue into four steps, we shouldn’t think of these as stacking blocks or even as stepping stones where we leave one for the next in line. It’s preferable to regard them as phases, as in the developmental transformations from egg to caterpillar to chrysalis to butterfly. Just as the butterfly doesn’t stack on top of these earlier manifestations or leave them behind, but rather incorporates and emerges out of them, our individual PREPARATION for dialogue is the interior source out of which community grows. No egg, no butterfly. No intentional presence of individual partners, no dialogue and no genuine community. What I’m calling intentional presence can be further analyzed into three virtues, by which I don’t mean moral qualities but actuated powers, as when we speak of the potency of medicine as its virtue. In the case of our intentional presence as individuals, the virtues in our intention to be fully present can be differentiated in terms of our being grounded in existence, centered in ourselves, and open to reality. When we are grounded, centered, and open, we are becoming more fully present. It’s important to understand that these virtues of intentional presence are not the result of effort, as if we must work to become grounded in being, centered in ourselves, and open to reality. The truth is that we are already these, but our mind gets distracted or lured away from this truth, tangled up and captivated inside its own designs. Each form of existence is grounded in being; if not, it wouldn’t be. Each individual is centered in itself; if not, it wouldn’t be one. And it’s also true that we are always open to reality – to the turning cosmos (or ‘universe’) and vibrant web of life; if not, we would instantly perish. So we require some sort of practice – a technique, a ritual, a simple meditative exercise – that can help refocus our conscious attention on this place and this moment, commonly called the here-and-now. There is no single and set way of doing this, but the counsel from our numerous wisdom traditions is pretty straightforward: Be still. Be quiet. Close your eyes and just breathe. Let yourself simply relax into being. If a focal object in front of you helps orient your attention; if soothing music and soft light help you calm down; if counting your breath occupies your mind and keeps it from wandering away, then include these supports as needed. The purpose of such a practice is to allow all your insecurities, all your concerns, all your judgments, and all your expectations to just fall away. What’s left is boundless presence: grounded in being, centered right where you are, and open to it all. As we should expect, such practices of intentional presence take on the character of our local cultures and traditions. And because historically it has been the enterprise responsible for mediating our minds to the present mystery of reality, we should neither be surprised nor offended if such practices still carry some of the formal features of religion. It is possible to ‘liberate’ intentional presence from these traditional accouterments, however; which is what we must do if our aspiration is to engage dialogue and create community across cultures in this increasingly secular and global age. Individual PREPARATION ensures – or more accurately, makes it more likely – that the productive dialogue and consilient effect of genuine community can arise. When partners take the time to be fully present (grounded, centered, and open), the dialogical phase of consideration can begin. We’ll explore that next. For our future to be long and prosperous, our species needs to learn better ways of getting along. Our growing population, along with the steady increase in the pluralization of global culture, is making it impossible to stay inside our provincial bubbles of meaning. More and more, we are confronted with the differences that characterize our remarkable diversity, but we’re still struggling with how to negotiate these differences and peacefully coexist. The high ideal would be that we develop methods, skills, and practices that will foster genuine community – not only in small pockets of intentional practitioners, but across the planet. We’ve made some headway, but there’s much work to be done. In this post and the next four, I will present a method which is highly effective when it comes to working toward resolution – whether it’s reaching agreement on a proposal, building mutual understanding, or resolving conflict between and among ourselves. The method is based in a therapeutic approach to health and happiness that I’ve been developing for a decade and a half, called Mentallurgy, which helps individuals take creative control inside the ‘mental theater’ of their own brain. It is importantly different from – and much more effective than – both talk therapy and drug therapy (the conventional forms of therapy most common today). Because the process for dialogue presented here uses many of the same skills introduced in my Braintracts blog, I’m naming it the Mentallurgy Method of Dialogue. For now we’ll only take a summary overview of the Method in order to get a sense of its process. In subsequent posts I will open up each of its four phases and dig into the details. 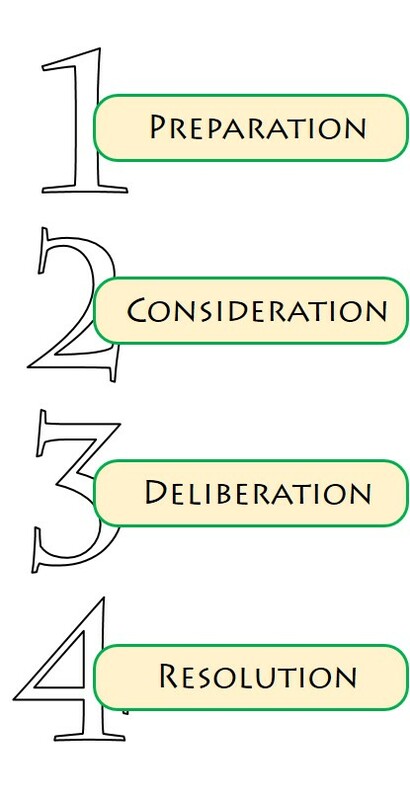 As the diagram above illustrates, effective dialogue moves through a developing sequence of steps, none of which can be skipped if we truly want to reach resolution (i.e., agreement, understanding, reconciliation, and unity). We should start by making a critical distinction between dialogue on the one hand, and conversation, discussion, or debate on the other. The latter are either too unstructured (conversation), topic-driven (discussion), or gladiatorial in pressing for a win-lose outcome (debate). Dialogue literally refers to the collaborative process of finding common ground and making meaning in which all partners are invested. This obviously requires some individual PREPARATION to ensure that dialogue partners come to the table in a creative, resourceful, and optimistic frame of mind. Individuals can’t do this for one another; each is responsible for doing the necessary “work before the work.” It’s common in everyday relationships for us to take a more passive, casual, or reactive role, so this step is essential for the Method to get successfully underway. With partners thus engaged in the process, the next step of CONSIDERATION can begin to cultivate the conditions in which healthy and productive dialogue takes root. We’ll look more closely at the art of dialogue, in the way it carefully navigates a middle path between urgency and conviction – the Scylla and Charybdis that have wrecked many a ship seeking successful passage to the island paradise of genuine community. Effective dialogue protects the space where each partner feels safe, welcome, and included. As partners clarify their common interests and values, DELIBERATION guides them through a simple system of factors that helps focus their work together on a goal that matters to everyone. Built into the term is the idea of balance (Latin līberāre), which speaks to the importance of staying aligned with our desired outcome even as we honestly appraise the serious effort required in getting to what we want, what we may have to give up for its sake, and the possibility of falling short of our goal. Realistic assessment, rather than starry-eyed wishful thinking, is intrinsic to the dialogical process. This careful balance of work, cost, and risk in pursuit of what we hope to gain by reaching our goal is the basic calculus of success. RESOLUTION is where partners come to agreement, understanding, and reconciliation around the matter of concern. The goal that was clarified during the deliberation phase might still lie in the future, but there is now a shared commitment to its realization. This distinction between project (a future objective) and process (an organic unfolding) is what makes dialogue different from a mere strategy meeting. Partners may well leave with specific task assignments, but the true resolution is a transformation by which separate individuals are lifted into the higher wholeness of genuine community. These four steps or phases in the process of creative dialogue together comprise a method that can help move us into a more peaceful and prosperous future. In coming posts we’ll look deeper into each phase, arriving eventually at a full understanding of how we can flourish together, and not merely get along. As far as we know, humans are the only species that constructs a habitat of culture ranging far beyond the natural imperatives of survival, reproduction, raising our young, and maintaining social order. All other species seem right at home in their natural environments, whereas ours is obsessed with understanding our place, how we got here, where we’re going, and why (or if) it matters. We struggle with a variety of neuroses rooted in a profound sense of alienation: of being misfits, orphans, or exiles from where we belong. In the mythology of every culture we can find stories that give account of this alienation, whether it is characterized in terms of dislocation, amnesia, or punishment for some primordial act of disobedience or rebellion. The role of religion in human culture has long been to resolve this crisis, restore our proper condition, and situate us meaningfully in a universe regarded as provident (i.e., sufficient, supportive, and even somehow invested in our fate). It’s been much more recent that we have come to understand the psychological factors behind our sense of alienation, of our sense of not belonging. The rise and development of ego consciousness, our forming an individual center of self-conscious personal identity, carries with it a growing sense of separateness from the rest of reality. Earliest cultures still enjoyed a participation mystique within the greater Web of Life, but as ego individuation progressed, so too did our perception of estrangement from it. According to a theory I’ve been promoting in this blog, the process of ego formation establishes our separate center of personal identity out of and apart from the grounding mystery (or Ground of Being) that constitutes our existence as (in descending order) sentient, organic, and physical beings. This necessary detachment is what we perceive as our separation. And if we should get too involved (or obsessed) with ourselves – or what amounts to the same thing, should we break too far from the grounding mystery within – humans inevitably succumb to the neurotic ailments alluded to above. Setting aside the important distinctions among types of religion (i.e., animistic, theistic, post-theistic) we can perhaps still appreciate the function of religion itself (from the Latin religare, to connect) as what keeps our developing individuality from snapping off and falling out of the provident Web of Life. Historically (if not so much currently) it has done this by holding individuals in community where they cooperate in a conspiracy of meaning, or better yet, a conspiracy of meaning-making. Religion engages this conspiracy (literally “breathing together”) of meaning-making by means of a matrix of four key factors: stories, sanctuaries, symbols, and sacraments (i.e., ritual performances in community). Individuals gather in sanctuaries, whether architectural or natural settings; they listen to their sacred stories; they behold and touch symbols of mystery and faith; they take part in sacraments that join them together as a community, and join the community to a provident reality. This four-factor matrix of meaning serves to answer those primary questions mentioned in my first paragraph. By means of this communal experience individuals are connected to one another, as they are connected as a community to a world of meaning. In this way, meaning-making facilitates world-building, where ‘world’ refers to a house of language, a canopy of significance, and a shelter of security that humans construct and inhabit. Religion has been the cultural enterprise inspiring and supervising this construction project over the millenniums. In my diagram, our world of meaning is represented as a stained glass sphere. Just as stained glass windows in a cathedral filter sunlight into a splendorous display of colors, shapes, and figures drawn from myth and legend, so each world (mine, yours, ours) conducts meaning that is unique to each of us, locally shared among us, and universally represented across the divers cultures of our species. In addition to the matrix of meaning and its four factors, religion has historically provided further support in the institutions that protect our world of meaning, traditions that preserve it across the generations, and in authorities who interpret, confirm, and defend its orthodoxy (i.e., proper thinking, right belief). Working as a system, these secondary supports ensured that individuals gathered on regular and special occasions in the sanctuary, listened to their stories, contemplated symbols of mystery and faith, and fulfilled their part in the conspiracy of meaning. With the encroachment of secularism, many of these institutions, traditions, and authorities have been degraded or rendered irrelevant in modern life, leading to a desertion of sanctuaries, the disappearance of sacraments, and a lost sensitivity to the metaphorical depth of sacred story. As we observe the struggle and decline of religion in our day, along with its desperate resurgence in fundamentalism, terrorism, spiritualism, and prosperity gospels, we need to keep in mind that religion is a complex phenomenon. As those authorities, orthodoxies, institutions, and traditions either retire, transform, or fall into obscurity, we might gladly see much of it go. But without a healthy relevant religion (in the functional sense of religare, not necessarily a confessional brand) to take its place, our worlds of meaning will continue to deteriorate. I am arguing that we still need places to gather, stories to share, symbols to contemplate, and rituals or routines of some kind to orchestrate our contemporary conspiracy of meaning. Otherwise our worlds will collapse as meaning dissolves. We will become increasingly disoriented, alienated, and careless in our way of life. This blog is partly devoted to the task of clarifying what I believe is the next stage in our evolving spirituality as a species. Already many are living as post-theists (rather than as atheists or dogmatic theists) but lack only the vocabulary and discourse to articulate it. Whatever institutions, authorities, and traditions we invent to protect, interpret, and preserve our shared world of meaning, we need to be sure that this new religion is effective in facilitating the connection between the Ground of Being (or grounding mystery) within us and the Web of Life to which we belong and owe our stewardship.